Once again I made these a LONG time ago and never got around to posting them. There was no recipe inspiration or anything. 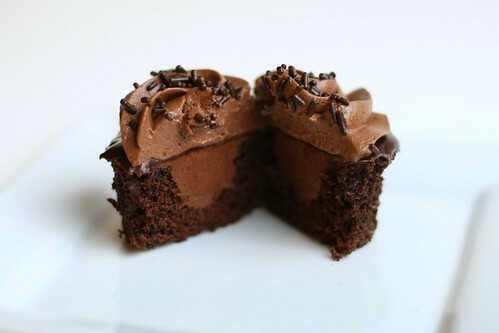 I was just having a chocolate fit and tried to figure out how I could get the most chocolate into one cupcake. This is what I came up with. Chocolate cake, filled with chocolate ganache, dipped in chocolate ganache, topped with chocolate buttercream and chocolate sprinkles. 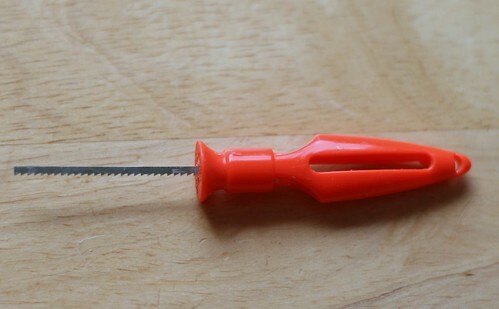 Why yes, yes that is a pumpkin carving tool! But it worked really really well. So people…improvise! To get my two types of ganache, one thick to fill and one still melted for dipping, I just made the ganache, kept the one I wanted to use for dipping on the stove and then put a separate bowl of it in an ice bath and whisked it until it was cool and thick. 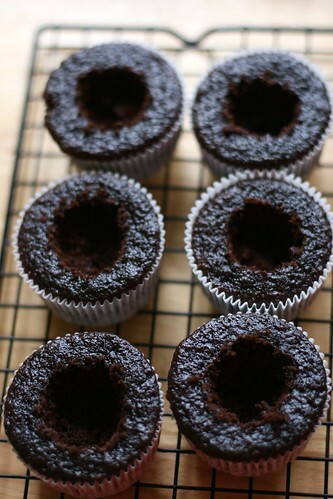 Then I filled the cupcakes as quick as I could. By the time I dipped the last one the melted ganache was getting hard but it all worked out! I did have to use a knife to spread the filled ganache nice and even otherwise there was a little part that stuck up. Not that it really truly matters because you will be covering it with a buttercream but I guess I’m just weird and wanted it flat. 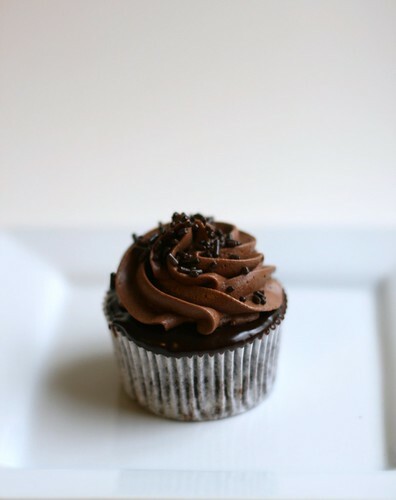 If you need a chocolate fix, this is will do it. A glass of milk and you’re in dessert heaven. 1. Heat oven to 350°F. Grease and flour two 9-inch round pans or one 13x9x2-inch baking pan. 2. Stir together sugar, flour, cocoa, baking powder, baking soda and salt in large bowl. Add eggs, milk, oil and vanilla; beat on medium speed of electric mixer 2 minutes. Stir in boiling water (batter will be thin). 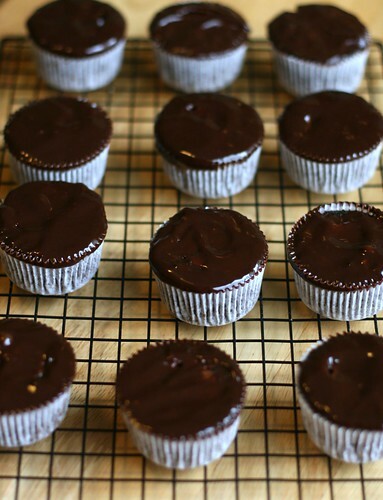 Pour batter into prepared cupcake tins. 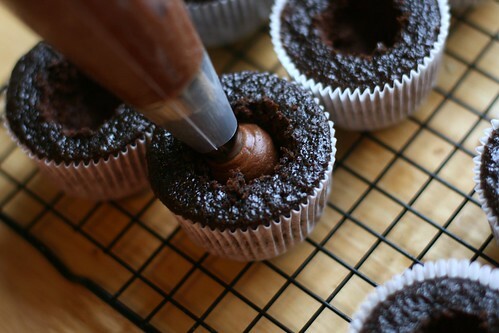 Using the paddle attachment on a Mixmaster or using a hand beater, beat the butter and chocolate together until smooth. Add 2 cups of the sugar and 2 tablespoons of the milk. Cream these ingredients until well blended. Add the rest of the sugar and the milk and combine. Add the vanilla and mix in.